Lucy Dreaming #1 Review – AiPT! A welcome coming of age tale that manages to deftly mix fantasy with typical teenage struggles. Since his rise from musical prodigy to renowned comic book creator, Max Bemis has created a signature style focused on juxtaposing “real life” protagonists with fantasies, escapes, and interaction with strange new worlds. As someone suffering from bipolar disorder, no doubt drawing on his own experiences, he has managed to convey feelings of alienation, isolation and abandonment but inject his own brand of dry humor. This is especially evident in the work he does for BOOM! Studios, most notably in 2013’s Polarity and 2015’s Oh Killstrike. I’M pleased to report that his latest serving for them, “Lucy Dreaming,” continues the trend. I’m not going to lie — when I came across this title, the first thought that came to mind was The Sandman as “dreams” and “comics” typically tend to evoke thoughts of that classic story to any well-read comic book fan. However, the other thought that came to mind was the possibility of this tale being inspired by “Lucy in the Sky with Diamonds,” the popular Beatles song from their seminal Sgt. Pepper’s Lonely Heart Club Band album that was influenced by Alice in Wonderland. After finishing the first issue of this series, I can say this is definitely more the latter than the former; a welcome coming of age tale that manages to deftly mix fantasy with typical teenage struggles, while still leaving just enough mystery to keep the possibilities spinning in our heads to set us up perfectly for the next issue. The titular character is an immediately relatable teenager who tries to lose herself in books while clearly running away from something or someone. We see her go through the day with parents, in class, and back at home, constantly reading and brooding throughout this routine. No matter what our path is in life, we can all relate to that age when we were all like Lucy — whether it’s keeping a diary, being annoyed by parents, or struggling to fit in socially amongst peers. In Lucy’s case, she also happens to have “mad scientist” parents at home and in school she breezes effortlessly through her English class. We hear her voice through a diary entry, which initially seems to indicate a typical teenager’s attempt to sound overly mature, but back at home, as she catches her parents in a rather loud late-night moment, the practicality of her wisdom comes into play as she comes across as the adult in the house. This is perhaps the one, very minor part that strikes me as a little confusing, as the first frame of the issue seems to indicate Lucy being quite young as she play-acts a scene from her book, while in this scene she acts wise beyond her years. It’s after this moment that Lucy is whisked into the dream world and becomes “someone else,” taking on the appearance and powers of Princess Eleanor Fadarr, who flashes shades of Princess Leia Organa of Star Wars fame. Attractive, adult, tough, confident, and even equipped with powers, she is everything that Lucy is not, and after initial disorientation, she embraces her new self as the “super powerful chick” she had just written about earlier in the day. All seems to be going well until the Princess comes across a sobering call-back to reality and the book leaves us on a cliffhanger that promises to reveal the truth behind the dreams and possibly more about who or what Lucy and Eleanor really are. What’s refreshingly surprising about Lucy is how she generally comes across as incredibly mature for her age, even more so than her parents. To some extent though, it makes you wonder how much of it is an artificial façade trying to compensate for something else and this is supported by the opening sequence noted previously. For one, there’s definitely a lot left unsaid about exactly what kind of a relationship she has with her parents. Typically, in many fictional narratives, most unlikely heroes like Lucy are thrust into their roles after toiling away due to harsh parent figures. In her case, on the surface it seems like she’s blessed as both parents are caring and loving but the story leaves things open-ended enough to suggest something’s wrong here based on her sarcasm, general misery and desire to be alone; rather than dig into and exploring something that could easily become cliché, Bemis respects the audience enough to leave it open ended for now. Really, it could be a variety of things wrong here — perhaps her parents are so successful as “mad scientists” that it creates insecurity for her to match their accomplishments, they’re either not home enough to spend time with her, or they are home but spend so much time with each other that it leaves her feeling isolated and alone. There’s a revealing monologue near the end where, just as we are made to think that these dreams are something more nefarious, Lucy adds another layer to the possibilities of what’s wrong in “real life,” that this could all sort of be a reflection of her struggle to come to terms with adolescence and having to grow up. This is immediately followed by the brilliant cliffhanger that promises to give us answers to some of these questions. The hope is that none of them turn out to be tried and true tropes and Bemis takes us in a completely unpredictable direction. The art style could be perceived as “toony” by some, but it is a perfect fit for the wry and humor-laden tone of the story. Michael Dialynas spent years on the critically acclaimed title The Woods, which was much more serious in tone and involved encounters with aliens. However, in this issue it seems like he’s practically poking fun of his prior experience as he conjures up heavily exaggerated, blobby alien sidekicks and melting, anatomically challenged alien enemies. 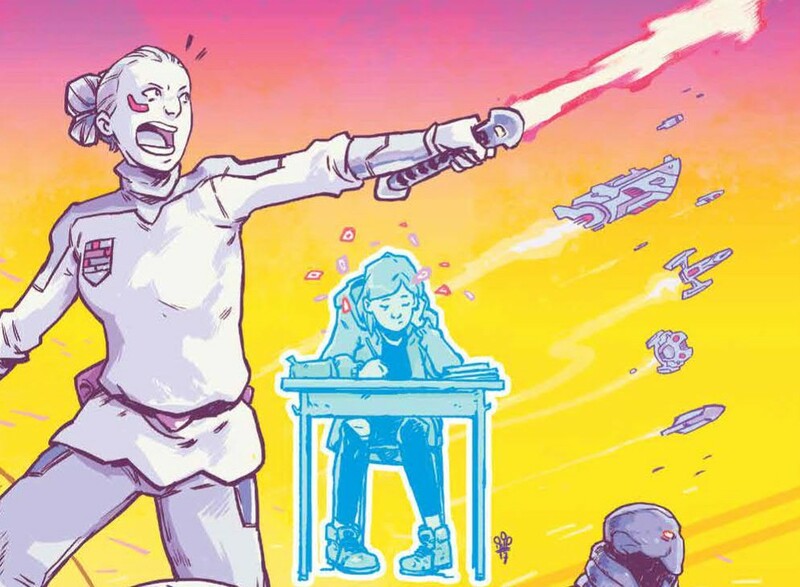 When the scene calls for seriousness, Dialynas adjusts well and when he needs to dial up the intensity, he can go toe to toe with the best, pulling out splash pages and action shots that are a great contrast to the mundane school life Lucy has during the day. Particularly near the end, Dialynas complements the story through his art by showing that many of these “epically penciled” sequences are actually a façade for something much more meager, quirky and simple underneath, and the transition is done in such a way that it never feels jarring but fits naturally. This opening issue of a five-part miniseries is a strong entry and has a great all-ages appeal to it. The story uses typical teenage escapism to poke fun at conventional sci-fi characters and storylines, while raising challenging questions about parenting and adolescence. The resolution of the cliffhanger in the next issue will tell a lot about how risky and innovative Bemis is planning to be with this title, but for now, you can’t go wrong in picking this up. The versatility of the art works for the dual-world setup of the story and is never jarring.